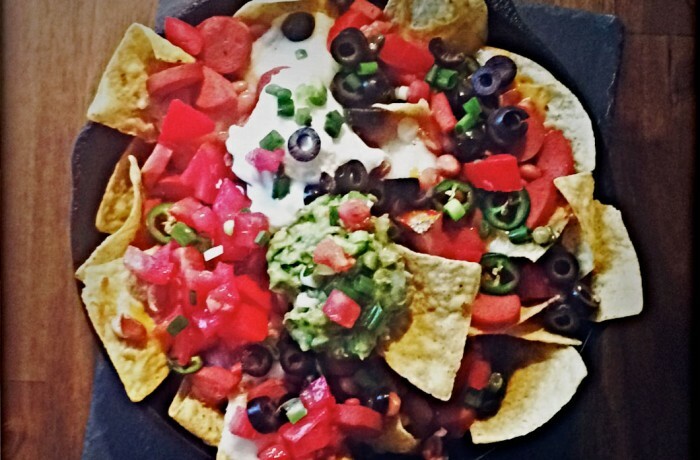 Gather friends and enjoy this fun and tasty twist on nachos. Layers of flavor will get you loads of compliments! Place hot dogs in a medium saucepan of boiling water and cook two minutes. On a large ovenproof platter or cast iron pan spread tortilla chips. Top with beans, cheeses, hot dog slices, and jalapeño slices. Bake in preheated oven until cheese is melted and bubbly, about 10 to 15 minutes. Remove from oven and top with olives, tomatoes, green onions, sour cream and guacamole.